Spencer developed an all-embracing conception of evolution as the progressive development of the physical world, biological organisms, the human mind, and human culture and societies. As a polymath, he contributed to a wide range of subjects, including ethics, religion, anthropology, economics, political theory, philosophy, literature, astronomy, biology, sociology, and psychology. During his lifetime he achieved tremendous authority, mainly in English-speaking academia. "The only other English philosopher to have achieved anything like such widespread popularity was Bertrand Russell, and that was in the 20th century." Spencer was "the single most famous European intellectual in the closing decades of the nineteenth century" but his influence declined sharply after 1900: "Who now reads Spencer?" asked Talcott Parsons in 1937. Spencer was born in Derby, England, on 27 April 1820, the son of William George Spencer (generally called George). Spencer's father was a religious dissenter who drifted from Methodism to Quakerism, and who seems to have transmitted to his son an opposition to all forms of authority. He ran a school founded on the progressive teaching methods of Johann Heinrich Pestalozzi and also served as Secretary of the Derby Philosophical Society, a scientific society which had been founded in 1783 by Erasmus Darwin, the grandfather of Charles Darwin. Both as an adolescent and as a young man, Spencer found it difficult to settle to any intellectual or professional discipline. He worked as a civil engineer during the railway boom of the late 1830s, while also devoting much of his time to writing for provincial journals that were nonconformist in their religion and radical in their politics. From 1848 to 1853 he served as sub-editor on the free-trade journal The Economist, during which time he published his first book, Social Statics (1851), which predicted that humanity would eventually become completely adapted to the requirements of living in society with the consequential withering away of the state. The last decades of Spencer's life were characterised by growing disillusionment and loneliness. He never married, and after 1855 was a perpetual hypochondriac who complained endlessly of pains and maladies that no physician could diagnose at that time. By the 1890s his readership had begun to desert him while many of his closest friends died and he had come to doubt the confident faith in progress that he had made the center-piece of his philosophical system. His later years were also ones in which his political views became increasingly conservative. Whereas Social Statics had been the work of a radical democrat who believed in votes for women (and even for children) and in the nationalisation of the land to break the power of the aristocracy, by the 1880s he had become a staunch opponent of female suffrage and made common cause with the landowners of the Liberty and Property Defence League against what they saw as the drift towards 'socialism' of elements (such as Sir William Harcourt) within the administration of William Ewart Gladstone – largely against the opinions of Gladstone himself. Spencer's political views from this period were expressed in what has become his most famous work, The Man Versus the State. Spencer also invented a precursor to the modern paper clip, though it looked more like a modern cotter pin. This "binding-pin" was distributed by Ackermann & Company. Spencer shows drawings of the pin in Appendix I (following Appendix H) of his autobiography along with published descriptions of its uses. In 1902, shortly before his death, Spencer was nominated for the Nobel Prize for literature, that was assigned to the German Theodor Mommsen. He continued writing all his life, in later years often by dictation, until he succumbed to poor health at the age of 83. His ashes are interred in the eastern side of London's Highgate Cemetery facing Karl Marx's grave. At Spencer's funeral the Indian nationalist leader Shyamji Krishna Varma announced a donation of £1,000 to establish a lectureship at Oxford University in tribute to Spencer and his work. The principles described by Herbert Spencer received different interpretations. Bertrand Russell stated in a letter to Beatrice Webb in 1923: 'I don't know whether [Spencer] was ever made to realize the implications of the second law of thermodynamics; if so, he may well be upset. The law says that everything tends to uniformity and a dead level, diminishing (not increasing) heterogeneity'. The alleged contradiction between Spencer's theory and the second law of thermodynamics might arise from limiting the definition of homogeneity and heterogeneity to the homogeneity and heterogeneity of the spatial distribution of matter. For instance, according to the second law of thermodynamics, molecules of gas filling a room eventually fill the room at similar intervals. On the other hand, the directions of motion of the molecules become more heterogeneous. Increasing heterogeneity of this sort aligns with the increase of entropy, related to the number of microscopic configurations consistent with the macroscopic quantities characterizing the system. Herbert Spencer considers Evolution, defined as the integration of matter and the dissipation of motion, to be necessarily followed by Dissolution, defined as the dissipation of matter and the integration of motion. Therefore, the heterogeneity of matter alone is not claimed to be ever increasing. 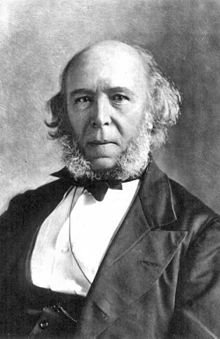 Additionally, Herbert Spencer states that Dissolution goes towards Equilibration, a state of the system with no differential Force between its parts. A comparison can be made of such state with Thermodynamic equilibrium, a state with no net macroscopic flows of matter or of energy. Spencer in his book Principles of Biology (1864), proposed a pangenesis theory that involved "physiological units" assumed to be related to specific body parts and responsible for the transmission of characteristics to offspring. These hypothetical hereditary units were similar to Darwin's gemmules. Spencer read with excitement the original positivist sociology of Auguste Comte. A philosopher of science, Comte had proposed a theory of sociocultural evolution that society progresses by a general law of three stages. Writing after various developments in biology, however, Spencer rejected what he regarded as the ideological aspects of Comte's positivism, attempting to reformulate social science in terms of his principle of evolution, which he applied to the biological, psychological and sociological aspects of the universe. Spencer's reputation among the Victorians owed a great deal to his agnosticism. He rejected theology as representing the 'impiety of the pious.' He was to gain much notoriety from his repudiation of traditional religion, and was frequently condemned by religious thinkers for allegedly advocating atheism and materialism. Nonetheless, unlike Thomas Henry Huxley, whose agnosticism was a militant creed directed at 'the unpardonable sin of faith' (in Adrian Desmond's phrase), Spencer insisted that he was not concerned to undermine religion in the name of science, but to bring about a reconciliation of the two. The following argument is a summary of Part 1 of his First Principles (2nd ed 1867). Spencerian views in 21st century circulation derive from his political theories and memorable attacks on the reform movements of the late 19th century. He has been claimed as a precursor by libertarians and anarcho-capitalists. Economist Murray Rothbard called Social Statics "the greatest single work of libertarian political philosophy ever written." Spencer argued that the state was not an "essential" institution and that it would "decay" as voluntary market organisation would replace the coercive aspects of the state. He also argued that the individual had a "right to ignore the state." As a result of this perspective, Spencer was harshly critical of patriotism. In response to being told that British troops were in danger during the Second Afghan War (1878-1880) he replied: "When men hire themselves out to shoot other men to order, asking nothing about the justice of their cause, I don't care if they are shot themselves." Politics in late Victorian Britain moved in directions that Spencer disliked, and his arguments provided so much ammunition for conservatives and individualists in Europe and America that they are still in use in the 21st century. The expression 'There is no alternative' (TINA), made famous by Prime Minister Margaret Thatcher, may be traced to its emphatic use by Spencer. While often caricatured as ultra-conservative, Spencer had been more radical earlier in his career – opposing private property in land and claiming that each person has a latent claim to participate in the use of the earth (views that influenced Georgism), calling himself "a radical feminist" and advocating the organisation of trade unions as a bulwark against "exploitation by bosses", and favoured an economy organised primarily in free worker co-operatives as a replacement for wage-labor. Although he retained support for unions, his views on the other issues had changed by the 1880s. He came to predict that social welfare programmes would eventually lead to socialisation of the means of production, saying "all socialism is slavery"; Spencer defined a slave as a person who "labours under coercion to satisfy another's desires" and believed that under socialism or communism the individual would be enslaved to the whole community rather than to a particular master, and "it means not whether his master a single person or society"
Spencer's association with Social Darwinism might have its origin in a specific interpretation of his support for competition. Whereas in biology the competition of various organisms can result in the death of a species or organism, the kind of competition Spencer advocated is closer to the one used by economists, where competing individuals or firms improve the well being of the rest of society. Spencer viewed private charity positively, encouraging both voluntary association and informal care to aid those in need, rather than relying on government bureaucracy or force. He further recommended that private charitable efforts would be wise to avoid encouraging the formation of new dependent families by those unable to support themselves without charity. In a letter to the Japanese government regarding intermarriage with Westerners, Spencer stated that "if you mix the constitution of two widely divergent varieties which have severally become adapted to widely divergent modes of life, you get a constitution which is adapted to the mode of life of neither—a constitution which will not work properly". He goes on to say that America has failed to limit the immigration of Chinese and restrict their contact, especially sexual, with the presumed European stock. He states "if they mix they must form a bad hybrid" regarding the issue of Chinese and (ethnically European) Americans. Spencer ends his letter with the following blanket statement against all immigration: "In either case, supposing the immigration to be large, immense social mischief must arise, and eventually social disorganization. The same thing will happen if there should be any considerable mixture of European or American races with the Japanese." Spencer's ideas became very influential in China and Japan largely because he appealed to the reformers' desire to establish a strong nation-state with which to compete with the Western powers. His thought was introduced by the Chinese scholar Yen Fu, who saw his writings as a prescription for the reform of the Qing state. Spencerism was so influential in China that it was synthesized into the Chinese translation of the Origin of Species, in which Darwin’s branching view of evolution was converted into a linear-progressive one. Spencer also influenced the Japanese Westernizer Tokutomi Soho, who believed that Japan was on the verge of transitioning from a "militant society" to an "industrial society," and needed to quickly jettison all things Japanese and take up Western ethics and learning. He also corresponded with Kaneko Kentaro, warning him of the dangers of imperialism. Savarkar writes in his Inside the Enemy Camp, about reading all of Spencer's works, of his great interest in them, of their translation into Marathi, and their influence on the likes of Tilak and Agarkar, and the affectionate sobriquet given to him in Maharashtra – Harbhat Pendse. Spencer greatly influenced literature and rhetoric. His 1852 essay, "The Philosophy of Style", explored a growing trend of formalist approaches to writing. Highly focused on the proper placement and ordering of the parts of an English sentence, he created a guide for effective composition. Spencer aimed to free prose writing from as much "friction and inertia" as possible, so that the reader would not be slowed by strenuous deliberations concerning the proper context and meaning of a sentence. Spencer argued that writers should aim "To so present ideas that they may be apprehended with the least possible mental effort" by the reader. Spencer influenced literature inasmuch as many novelists and short story authors came to address his ideas in their work. George Eliot, Leo Tolstoy, Thomas Hardy, George Bernard Shaw, Bolesław Prus, Abraham Cahan, D. H. Lawrence, Machado de Assis, Richard Austin Freeman, and Jorge Luis Borges all referenced Spencer. Arnold Bennett greatly praised First Principles, and the influence it had on Bennett may be seen in his many novels. Jack London went so far as to create a character, Martin Eden, a staunch Spencerian. It has also been suggested[by whom?] that the character of Vershinin in Anton Chekhov's play The Three Sisters is a dedicated Spencerian. H.G. Wells used Spencer's ideas as a theme in his novella, The Time Machine, employing them to explain the evolution of man into two species. It is perhaps the best testimony to the influence of Spencer's beliefs and writings that his reach was so diverse. He influenced not only the administrators who shaped their societies' inner workings, but also the artists who helped shape those societies' ideals and beliefs. In Rudyard Kipling's novel Kim, the Anglophile Bengali spy Hurree Babu admires of Herbert Spencer and quotes him to comic effect: "They are, of course, dematerialised phenomena. Spencer says." "I am good enough Herbert Spencerian, I trust, to meet little thing like death, which is all in my fate, you know." "He thanked all the Gods of Hindustan, and Herbert Spencer, that there remained some valuables to steal." See also Spencer, Herbert (1904). An Autobiography. D. Appleton and Company. ^ Talcott Parsons, The Structure of Social Action (1937; New York: Free Press, 1968), p. 3; quoting from C. Crane Brinton, English Political Thought in the Nineteenth Century (London: Benn, 1933). ^ a b "Letter 5145 – Darwin, C. R. to Wallace, A. R., 5 July (1866)". Darwin Correspondence Project. Retrieved 12 January 2010. ^ In 1844, Spencer published three articles on phrenology in The Zoist: A Journal of Cerebral Physiology & Mesmerism, and Their Applications to Human Welfare: "A New View of the Functions of Imitation and Benevolence" (Vol.1, No.4, (January 1844), pp. 369–85); "On the Situation of the Organ of Amativeness" (Vol.2, No.6, (July 1844), pp. 186–89); and "A Theory concerning the Organ of Wonder" (Vol.2, No.7, (October 1844), pp. 316–25). ^ M. Francis (23 December 2014). Recension of Herbert Spencer's life. Routledge. pp. 7–8. Archived from the original on 30 December 2018 – via ndpr.nd.edu. ^ quoted in Egan, Kieran (2002). Getting it wrong from the beginning. Retrieved 14 June 2013. ^ Turner, Jonathan H. (1985). Herbert Spencer. Beverly Hills, CA: SAGE Publications. ISBN 0-8039-2244-2. ^ Doherty, Brian, Radicals for Capitalism: A Freewheeling History of the Modern American Libertarian Movement, p. 246. ^ Stringham, Edward. Anarchy and the Law. Transaction Publishers, 2007. p. 387. ^ Stringham, Edward. Anarchy and the Law. Transaction Publishers, 2007. p. 388. ^ Herbert Spencer, Facts and comments, p. 126. ^ Social Statics (1851), pp. 42, 307. ^ Chris Matthew Sciabarra, "Libertarianism", in International Encyclopedia of Economic Sociology, ed. Jens Beckert and Milan Zafirovski (2006), pp. 403–07 online. ^ Offer, John (2006). An Intellectual History of British Social Policy. Bristol: Policy Press. pp. 38, 142. ISBN 1-86134-530-5. ^ Stewart, Iain (2011). "Commandeering Time: The Ideological Status of Time in the Social Darwinism of Herbert Spencer". Australian Journal of Politics and History. 57 (3): 389–402. doi:10.1111/j.1467-8497.2011.01604.x. ^ Hearn, Lafcadio (2012). Japan: an Attempt at Interpretation Kindle Edition. pp. Appendix. ISBN 1406722383. ^ Quoted in John Offer, Herbert Spencer: Critical Assessments (London: Routledge, 2004), p. 612. ^ Gertrude Himmelfarb, Darwin and the Darwinian Revolution, 1968, p. 222; quoted in Robert J. Richards, Darwin and the Emergence of Evolutionary Theories of Mind and Behavior (Chicago: University of Chicago Press, 1989), p. 243. ^ Richard Hofstadter, Social Darwinism in American Thought (1944; Boston: Beacon Press, 1992), p. 32. ^ Mark Francis, Herbert Spencer and the Invention of Modern Life (Newcastle, UK: Acumen Publishing, 2007). ^ Benjamin Schwartz, In Search of Wealth and Power (The Belknap Press of Harvard University Press, Cambridge Massachusetts, 1964). ^ Kenneth Pyle, The New Generation in Meiji Japan (Stanford University Press, Stanford, California, 1969). ^ Spencer to Kaneko Kentaro, 26 August 1892 in The Life and Letters of Herbert Spencer ed. David Duncan (1908), p. 296. ^ Savarkar, Vinayak Damodar. Inside the Enemy Camp. p. 35. Smith, George H. (2008). "Spencer, Herbert (1820–1903)". In Hamowy, Ronald (ed.). The Encyclopedia of Libertarianism. Thousand Oaks, CA: SAGE; Cato Institute. pp. 483–85. doi:10.4135/9781412965811.n295. ISBN 978-1-4129-6580-4. LCCN 2008009151. OCLC 750831024. Weinstein, David (27 February 2008). "Herbert Spencer". In Zalta, Edward N. (ed.). Stanford Encyclopedia of Philosophy.